UPDATE JUNE 2014: Please note that in the blog below I create custom RFCs for this purpose which I would no longer recommend. As discussed in the comments made by Ron Sargeant to this blog and also in his own blog Improved Inside-Out Modelling where also Krishna Kishor Kammaje joins in the discussion a code based approach would have been a far more elegant solution than creating custom RFCs. I hope to update this blog with a code based implementation of the same sometime in the future. The aim of this blog is to provide a step by step approach enabling anyone that needs a gateway service to upload/download files to SAP backend to develop it in no time. In this blog I have listed some existing blogs and SCN posts regarding this topic. These have helped me manage to develop my upload/download service but none of them give a full step by step approach of how to do this and they refer to different versions of Gateway. You can of course adjust these properties to your need but the mimetype and value (stored as rawstring) will always be needed. Two Remote Function Modules was then developed. One that can upload a file to the table above and one that downloads from it. It simply executes a read on the table using the key values and sets the export parameters. Furthermore in the model provider class <classname>_MPC this line of code is dynamically added: lo_entity_type->set_is_media(‘X’ ). When entity type has been marked as media (as described in step 3) we also have to mark which of the entity properties that holds the mime type of the object. This needs to be done programmatically by redefining the method DEFINE of the model provider class <classname>_MPC_EXT. 20140127 Updated code below to perform correct read after upload. You can use the built in Gateway Client tool to test the service. You execute the client tool from /iwfnd/maint_service and then in the tool you can use the “Add File” button to add a file to the POST request and the + button to add headers to the post request. In the post command you need to add the headers “Content-Type” and “slug”. For example for PDFs content type should be “application/pdf” and slug needs to contain the key – in my case filename. Note that if you use Gateway client tool you don’t have to supply content type parameter. NOTE: If you are not using the Gateway client test tool you also need to remember to add the X-CSRF-Token in the header of the post command. You can get the token by issuing a GET to the service with the header=x-csrf-token and value=fetch. You will then be able to read the token in the response and can supply it in the POST. On successful POST the document is stored in the database table and you get some xml response back. PROBLEM: in my response I’m missing the keys of the just uploaded document as shown below. So I guess I’m doing something wrong in my implementation of CREATE_STREAM as described in 5.C. Has anyone got some hints for me to solve this? Note that in my example the Personnel number and creation Date are automatically retrieved by the service implementation so doesn’t need to be supplied in the post. I have written these services to the best of my knowledge but I’m very interested in getting feedback and possible improvement points. Re: Upload File with parameters? Good stuff. We should remember that for a live implementation the virus scanning option is most likely to be required; not many security administrators are going to let unscanned files into the backend. Hi Ron, can you refer to a document/blog describing the approach for this? first i want to thank for the great post, which is very useful. i’m facing an issue while following the above process because in my scenario i’m creating RFC(Function modules & table in ECC-Backend) and i’m creating oData service in Netweaver Gateway-Frontend. i have followed your code snippet for Display Image Its working fine. So for that im calling Create_Entity method in Create_Stream method. But while calling the method its going into Exception. 1. Is it the correct way to do? 3. If i don’t pass the data also its going into Error & If I pass also its going into exception. For this i have followed another way i have copied code from Create_Entity method and passing the value here manually.I dont think this is correct way to do it. Now the Image is uploading in Table but in showing an error in Gateway Client. Any suggestions are highly appreciable. I am facing an issue with downloading the file attached and saved in custom table, it would be of great help if it could get resolved with your help. I am trying to implement the same, upload was successful we were able to save the data in table. But while download getting some issue. on clicking response in browser we get error as shown below. we tried with PDF format and JPEG format as well. Did you find any solution for this issue ? I am also facing a similar issue while trying the same for excel file. I am giving the file format as ‘xlsx’. On click of ‘Response in Browser’ button in gateway client, i’m always getting an excel sheet with the first record only. (despite querying some other record). The installation of a virus scanner, or it’s location, etc are usually managed by Basis. So when it goes over to an environment where the scanner is mandatory, Basis have carried out that activity. In terms of the Gateway development, it should not require you to alter the code. The inbound request handling detects if a binary stream, such as a file attachment, is part of the request – it then invokes the virus scanner according to the scanning profile. In development we tend to simply turn it off for convenience. Yes I’ve turned it off in our development environment as well but know this is an area we have to look at for production. Worst case in our scenario is that a user opens a document from SAP that includes a virus and it should then be caught by virus software on the PC. Jan, I believe this will solve the problem you have stated. At the end of CREATE_STREAM you need to do a GET_ENTITY and pass it to ER_ENTITY. For reference, look towards the end of any of the CREATE_ENTITY method . Looking at it now I actually realize that I was copying the stream back into the response which was also not very wise from a performance perspective. I will update the blog. Your welcome Jan, glad I could add something to your blog. I have created this example and it is working fine.. For you suggestion to send back key fields.. how we can call get_entity after create_stream.. I am using Transaction SEGW. data lo_tech_read_request_context type ref to /iwbep/cl_sb_gen_read_aftr_crt. lo_tech_read_request_context->set_keys( importing et_keys = lt_keys ). lo_tech_read_request_context->set_entityset_name( importing ev_entityset_name = lv_entityset_name ). data ls_entity type ref to data. When i tried ur code, i could not see the key name and values passed to IT_key_tab. where and what could have wrong ? any idea ? Internal table will be having 2 fields. one is key and another is value. The internal table will capture the value based on which method you have implemented and which method you have called. Can please give more detail about the methods redefinition? Especially for case B and C. Because i’m a bit lost trying to redefine the methods. For example: find the value for pernr to call the previously created RFC. I’m “following” you 🙂 Can you see my email? I am very new to sap net weaver gateway and got a requirement on how to upload a file through gate way service and have created table as mentioned in document but i am bit confuse while implementing zfunction module. I went through standard service RMTSAMPLEFLIGHT, got sucessfuly downloaded file. If you connect with me I think I can send it to you. How can we connect Can you see my email? when i am trying to create(POST) the file into ztable via REST client (google chrome advanced version) getting error as file has unsupported format (415) error. not sure – which media type are you trying to submit? I don’t understand where am wrong..
First try to see if you can get the post command to work in the built in netweaver gateway test client. In there you don’t have to worry about the token. Can you get that to work? From your POST request above it looks like you are not supplying the x-csrf-token correctly. You get the token using a GET request with the fetch command. It looks like you are using fetch in the POST above. In the POST you supply the token key instead of the fetch command. Thanks for this wonderful blog. I was actually able to implement the file upload and download as you have mentioned. I would perhaps like to ask you and other experts if they could help me achieve a similar thing (file upload and download) for multiple documents. i.e. I want to upload multiple PDF’s into the SAP system through Netweaver Gateway. I tried out the Batch Processing methodology however through the gateway client i could process only one document at a time.If i try to upload multiple files the gateway client rejects the old one and processes the latest file. if you help on this would be very appreciable. I also have the requirement of file uploading in gateway. Currently am able to get the control to create stream method. Could you please help me out how can i read the details of the file and upload the file into the table.? I am working on uploading file in SAP using NW. I am able to read the ‘.jpg’ files and upate them using SEGW. Any how for POST am not getting value for other attributes of entity.. I am able to get file type and content in IS_MEDIA_RESOURCE. How can i get value for attributes defined for my entity type apart from media content.. Like in you example how we can get value for PERNR, File name & other attributes..
For the post I think you only have the “slug” value to pass attribute information in. I use “slug” for the filename in my example. If you want to use it for more than 1 attribute I guess one method could be to define that first 10 characters are for pernr, next 10 for filename etc. I’m not sure but I’d be interested to know if and how you solve it. I have been playing around with a service to upload multiple files but without luck so far. Well i am trying to explore more options.. It is working fine for .jpg, pdf and excel files.. But it excel file having formatted data it is throwing exceptions.. Anyone faced the same issue.. Please assist. My blog is about uploading a file into a table. Have you gone through the blog step by step? If so where exactly are you facing problems? Yes i got it. I am able to upload the file. Well written .Surely will try this and let you ask to qns if i have facing any issues. your code so that I can follow accordingly . I referred back to this yesterday as I was doing some file transfer work. I hadn’t noticed the RFC bit! What’s wrong with code based-implementation? If you’ve got to write code, might as well do it in the DPC implementation. Creating RFC just adds more obfuscation to a simple job. Thank you for your comment. I must admit I hadn’t thought about that option. But I guess you are right – I could simply put the RFC code into the DPC_EXT classes to keep it simple. I’m used to using SAP standard RFCs to implement gateway services so when I needed custom code like in this example I thought about custom RFCs. I will consider this in future service implementations. Let me know if you have more thoughts on this. I tried creating scenario explained by Jan. I get the error “No default virus profile active or found. Please check the offical guide”. How to find out of several virus scan profiles which to choose ? I’m guessing you don’t want to “mess around” with virus scanning installation, so the easiest option is to turn it off. Go to SPRO: Gateway/Administration/General Settings/Virus Scan Profile. Execute and tick the ‘Off’ checkbox. I got a requirement on how to upload a file through gate way service and have created table as mentioned in document but i am bit confuse while implementing RFC for UPLOAD. My requirment is to upload PDF file from UI5 screen to SAP Back end server. Now I have created one RFC and a project in segw . But in segw project when i create service implimentation, it gives warnings like Mapping of Create operation without Read may cause an error at runtime. Since i am going to upload i only implimented create . Kindly help me here . The warning you get is becuase the gateway per default always issues a read after a create operation has been carried out. I suggest you implement the GetEntity operation as well to avoid this warning. Right now i am using same for both upload/download. is this way is correct? Will read UI5 if i pass xstring/binary data as a Odata? Code above is not working. I have an entity which has other properties like created by, docCategory etc. But how can i pass the values of these parameters while testing my service from NW gateway client. I am using Post method and added a file. I don’t want to include these other attributes in ‘Slug’ header. is there any other option ? I think your only option is to pass these values in the slug parameter. You can always do some key/value pairs and then have the logic to split them up in the code. Let me know if you find a different way to achieve this. As far as I know this code is pretty standard to perform a read. You can see similar code being auto generated in the DPC classes when you implement a standard GET_Entity/Read method. What exactly is causing you problems? first…thanks for the sharing of your idea and thoughts. But i am still encountering problems. i’ve managed to create the table, the rfc’s an the gateway service including the mapping. But my ABAP-Skills aren’t that good to know, how to change the code to my needs. i want to consume pdf’s or any other file through a ui5 application. Download or just viewing. can you send me the code for reading a stream and marking it as a mime type? Thanks Volkan for the valuable suggestion. now it is not throwing that error. other errors are there, i m trying to solve it. thanks a lot for saving my time and efforts. Need some lights on,what is the maximum file size that can be uploaded as a Image from the front end. I am getting error code 3 as a server response while uploading the image in Phone Gap.. Thanks for the excellent blog . I have a requirement to download the content which is shown in the UI5 screen to presentation server (on click of buttton in Ui5). Can Ui5 sent the table content in screen via is_media_resource-value?. In addition they need to send the path for the file to be downloaded ,type of file to be downloaded(CSV or PDF) ,Which appln file (with this I know the structure/Table type to write the file content). Your terminology is wrong here. You do not communicate with the “presentation server” to obtain content, that would be your content server, and in since we are in the Gateway space (not UI5), let’s assume it’s GW. Physically, UI5 and GW may be on the same server but they are reached by separate ICF nodes. Having got that out of the way, you need to explain what your actual content is more clearly than just ‘table’. If it is just tabular data, then it should not be treated as a file if it did not originate as a file. It’s typically an entity collection. The use case you are attempting might be valid if the application did something like opening an Excel file in the UI5 frontend and presenting the content in a non-Excel way. You might then decide that the file should be saved to the content server so that it can be reloaded elsewhere into the UI5 app, i.e. not reliant on the original local PC copy. Even then there is a case for transforming it into an OData entity instead. My requirement is simple . On click of ‘download’ button it should download the tabular content(Shown in UI5 ) as CSV file to users desktop . If i model it as an Entity type , then only CRUD operations are supported.How do I model a download operation for an Entity type ? Do I need additional properties(File Path,File Type etc) in all these Entity types where download is required? Even if I model it as a Fx import, can they send a request body(data to be downloaded) with the Fx import ? May be POST Fx import? If you want to save data to the PC (presentation client, local) you cannot achieve this with Gateway. GW is about backend service communication, not local services. Please redirect this question to the correct SCN Space for a better hope of getting an answer. You are right with my requirement. But if UI is showing first 20-30 records only of the 500 records and on click of download the user wants to download the entire list, then it needs to be done in GW/backend. From the GW side ,I need to call CL_GUI_FRONTEND class methods to download the data to PC . In this case the UI will be passing the URL along with the filter and I will handle the download in the GET_ENTITYSET of the corresponding Entity type after calling the Backend FM . How will I pass the File path,File Type and I need an indicator in GW to understand the user has asked for the Download action? Sorry Arshad but what you are proposing is impossible. CL_GUI_FRONTEND interacts with SAPGUI API calls. For this to happen, you need a terminal session. Gateway communicates via http, is stateless and has no terminal. GW is totally agnostic of the PC or whatever device it is serving. You need to use client side development for this, forget Gateway file streaming; you are just complicating the matter! 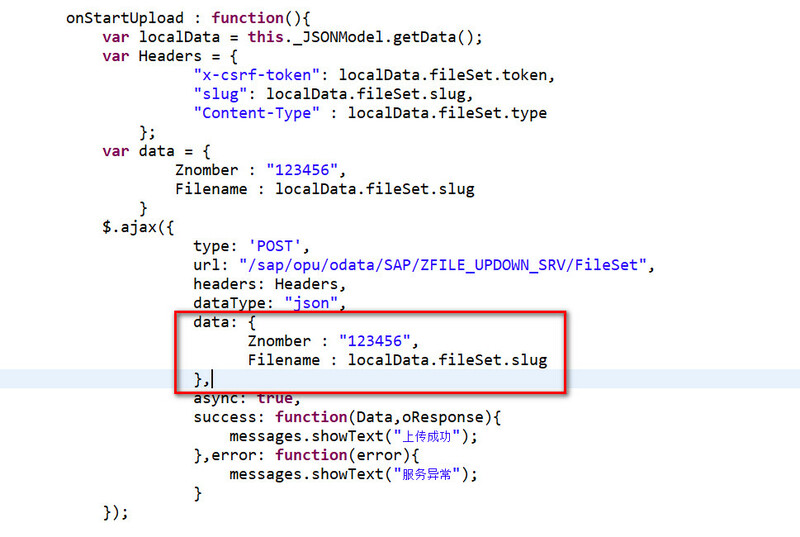 If your app wants to send all of the table to file, UI5 must ask for the full table data as an entityset from Gateway and then package it into a download locally. As i know we can achive using SAP DMS for store file and content from oData Services. If your Gateway is running ABAP 7.4 you could perhaps use the ?$format=xlsx URI option if you want to download the data that’s bound the a table control in UI5. Just re-execute the same service call that the table is bound to, but append the format=xlsx option and it should trigger the download as a standard browser download. Great Blog….!! I have followed your blog and able to download and upload files from gateway client. I am looking to access this oDATA service from UI5. Can you please share me the code or link which does this work. If you find your service in /IWFND/MAINT_SERVICE, select it and choose Call Browser you can see the entire path to the service. Great Blog!!! Here i am coming up with new requirement like, how can we show more than one attachment in single GET Call. I have a following problem. Currently we are useing OpenText repository to store attachments. Everything is fine when we are uploading and downloading files in LAN. But when we are outside our network we can’t download attachments beacuse URL points to a local IP. Is there a method to download attachments without exposing OpenText repository to Internet? Did you tried VPN ? Also let me know if you get this issue resolved by any other mean if not by the one I had mentioned. Thanks for posting this, I got this setup fairly quickly and it works really well. It would be of great help if could help us also to implement this. please find my queries mentioned below post. I could implement all thanks to your blog, thanks again. But still I have the problem of empty keys, What was the solution? please find my queries mentioned in below post. Thanks for your reply… I have written the code as suggested by you, please find the same as attached. please advice for changes needed if any. on downloading the PDF file we get error as attached, please have look at it. This error is for other reason. The PDF binary file is corrupted in table, because the response is from the PDF Reader application and not of the NW Gateway. Upload correctly the file again. Remember, the correct format en BINARY(LRAW), not XSTRING. If PDF binary file is corrupted in table then I guess all the files getting uploaded in table is corrupted and as a result of which it is not getting displayed correctly when downloaded. Currently uploaded file is referring to the data element XSTRINGVAL in custom table. Please refer the below table. If it referring the wrong type, request you to provide with the correct type. Thanks for such a nice documentation on upload and download of attachment using Net-weaver gateways. Try sending a jpg file and see if that works. Thanks for such a quick reply, we tried with a PDF file it got downloaded but there was no content, it also had error in opening the file. If you could please throw some more light on it. Did you try a jpg? The reason I suggest that type is the GW Client can render it without opening an external app (like Windows viewer). Tried with JPEG, on testing with gateway client still not able to view the file, please find the output attached. kindly suggest. Try naming your file entity.jpg. Also you may want to try testing with a REST client vs the GW Client, there is a plugin for FireFox that works well. How I can upload files from aplication web. I using oModel.created(‘serviceUrl’). I need to pass parameteres into headers. I arrive to GW Client but without parameters. Thanks for the wonderful blog!! Was able to develop a sample service. If we need to send the POST & READ requests in JSON then what should the request be like in this case? Tried the usual “$format-json” but that does not work. Any ideas? Not sure if this is possible. I am Mervin, I’m sorry to trobule you, i have a querstion for need your help. I create function model and Neweaver oData. I want send the Znomber to oData ,But , it is error, Request URL or element is not defined correctly. Do you know how to send other data to Netweaver.